These day people have tons of audio and video files in their computer. Most of us find no time to organize those files by category wise in the structured folder When you have to deal with large audio libraries, it is quite difficult to find a specific mp3 song or video to play. Do you want to solve these problems? You have to organize the music collection by their metadata tags such as creation date, genre, artists. After that, you can move them to separate folders according to these criteria. 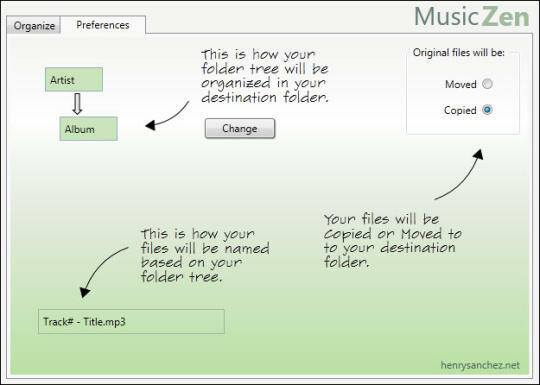 MusicZen will not tag your music files; rather, it will read the existing tags in your .mp3 files and use this information to create the directories. If MusicZen Portable does not find any tag information, it will place the files in an “Unknown” folder. How to use this MusicZen to organize the MP3 Songs and Videos ? The MusicZen interface has two different tabs: Organize and Preferences. The first tab Organize allows you to select the source and destination folders for the music files, and provides you with a button to start the process. The Preferences tab offers the options, how your music will be organized. You can choose whether to move the files from the source to the destination folder, or just copy them there. Just click the Change button to view all the available styles for folder tree structure and file renaming. After you have done this, go to organize tab and select the source and destination folders. Then Click the ‘Organize’. That’s it, your files will be organized and sorted based on your selection. You can also store your organized music files in Google Play Music service for free and listen music anywhere and from any device. If you are the music lover, MusicZen is the must have tool for you to organize the music collections easily. MusicZen supports both 32bit and 64bit computers of Windows XP,Vista, Windows 7 and Windows 8.